Click on the photo above to see the Photo Gallery Page. 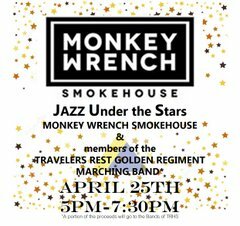 Come out to Monkey Wrench on April 25th from 5pm until 7:30pm and enjoy jazz played by members of the TRHS Band program. A portion of the proceeds from the night will go to the Bands of TRHS. The final blood drive of the year will take place on Friday, April 26th in the library. Donors must be 17 and weigh at least 110 lbs. 16 year olds may donate with a signed parent waiver. See Mrs. McCarrell for the 16 year old waiver or if you have any questions. Please complete the link below to register for a time slot. Any Seniors with Perfect Attendance? Attention Seniors!! If you feel you have had 12 years of perfect attendance, please see Mrs. Elledge in the attendance office as soon as possible!! Thank you! TRHS Cheerleading will be having tryouts for the 2019-2020 season open to rising 7th-12 graders on April 22-26. Please email skozic@greenville.k12.sc.us for more info. If you have a broken or damaged Chromebook bring it to in media center immediately. See Ms. Gordon with any questions. Seniors should regularly check the Scholarship Update posted on the Counseling Department webpage and linked below. New scholarship opportunities are added throughout the year. Contact your counselor for more information. The spring End of Course Tests will be given on the following dates. More information will be provided as we get closer to these dates. News Updates can be found at our TRHS News Twitter site. No account is necessary to view the updates. Be sure to like us on our official TRHS Facebook page as well. Current stories, photos, and news will be updated regularly so check back often and share with your Facebook friends. Also check out the student-produced newspaper, The Blue and Gold online edition. . It includes the latest news, sports, reviews, opinions, and photo galleries produced by the newspaper staff. You can also download the app on Google Play Store or the App Store. Search for theblueandgold. For everything you need to know about our yearbook, go to The Traveler website. You can find out how to order, take a peek behind the scenes, and much more. Check it out today! Use our Online Store to pay class dues and much more. Greenville County Schools' Parent Portal is an online gateway for parents to information about their child's education. Parents must have an access ID and password to obtain their children's school information. Because this information is sensitive, parents must pick up the access ID and password in person at their child's school and show proper identification. The school will not email, mail or provide the information over the phone. If you would like to receive text alerts and currently have a landline listed as your home number please fill the form below and return it to the main office. By listing a cell phone as your home number you can receive texts for school closings and other emergency information. There is a new program available to parents who would like to learn English and become more involved in their child's academic achievement. For more information see the information on the GCS website. All grades for your student will be posted within seven (7) calendar days from the date the assignment/assessment is collected. Major projects and lengthy term papers will have grades posted within fourteen (14) calendar days of collecting the assignment. 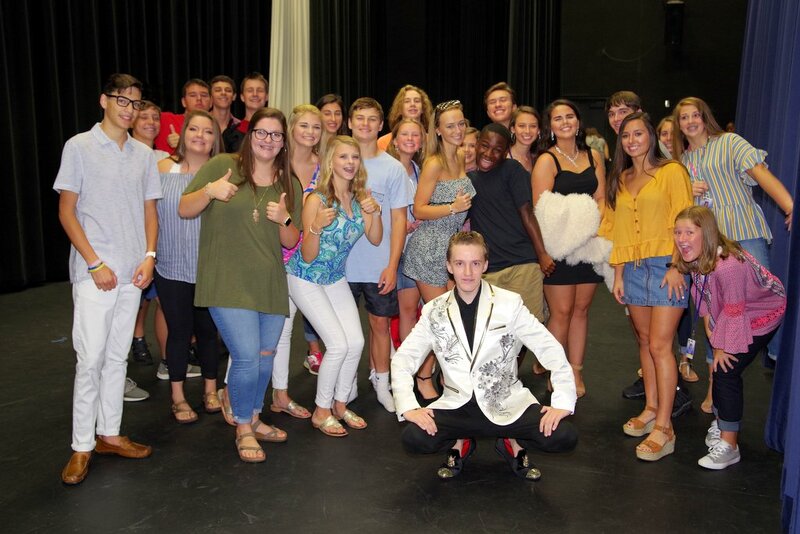 The Travelers Rest High School community believes that the high school program should prepare every student to live and compete in a global society, setting academic standards within a curriculum appropriate for each student, and provide a learning climate of order, safety, respect, and purpose. We exist to educate students both academically and socially so that they become responsible citizens of our local and global community. The faculty and staff see Travelers Rest High School not as an end but as a beginning of a journey toward enlightenment. Spirit Week 2019 resulted in the second highest total ever raised and the highest in ten years with a total of $35,730.31 raised. Kipra Anderson, founder and Executive Director of Let There Be Mom spoke to the student body at the pep rally held to announce the total. 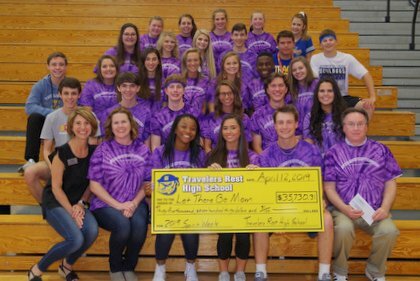 Let There Be Mom was this year's Spirit Week charity and works to preserve the legacies of moms and dads with life-threatening illnesses. As the week comes to a close Spring Break has arrived. Classes will resume on Monday, April 22nd. Travelers Rest, SC (April 9, 2019) � For its exemplary record of leadership, service, and activities that serve to improve the school and community, the Travelers Rest High School student council has been recognized as a 2019 National Gold Council of Excellence by the National of Student Council (NatStuCo). Travelers Rest High School has received this award for eleven years in a row. "Receiving a National Gold Council of Excellence Award reflects the highest dedication on the part of the school to providing a strong, well-rounded student council program," said Ann Postlewaite, National Association of Secondary School Principals (NASSP) student programs director. "NatStuCo applauds the work of the National Gold Councils of Excellence and challenges them to continue their leadership and service to their schools and communities." To meet the requirements for the National Council of Excellence Award, a student council must meet a variety of criteria. In addition to basic requirements such as a written constitution, regular meetings, a democratic election process, the councils have demonstrated successful sponsorship and participation in activities such as leadership development and service to the school and community. Councils awarded the gold level of the award have successfully demonstrated the highest levels of leadership. National Student Council (NatStuCo) provides and promotes professional development and leadership training to student council advisers who, in turn, teach leadership skills to student council members. NatStuCo is dedicated to preparing and empowering student leaders to better serve their schools and communities. For more information, visit www.NatStuCo.org. The 2019 Prom was held on Saturday night at Larkin's Sawmill. 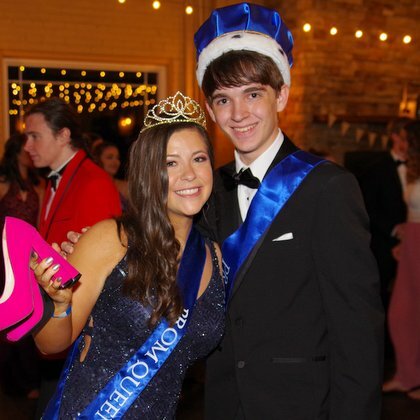 Seniors Keely Burgs and Nathan Laws (pictured above) were named Prom Queen and King. For photos from the Prom and from the Senior Walk click on the links below. Alive at 25 is an early intervention program developed by the National Safety Council to prevent traffic violations, collisions, and fatalities. It is a 4 ½ hour defensive driving course that addresses the dangers of speeding, failure to use seatbelts, using cell phones while driving, eating while driving, driving under the influence of alcohol and drugs, and more. It focuses on the behaviors that young drivers exhibit behind the wheel, and allows the student to recognize the consequences of those actions. Completion of the program is required for any student that parks on campus.